Recently, I complained on Facebook about the effect the cold weather + regular water aerobics in a salt water pool was having on my skin. Deb Keller of Thistlewood Manor sent me a couple of lotion bars. It's amazing how much difference they are making. The issue with lotions was they were evaporating too fast so they needed constant reapplication. The lotion bars, straight after showing off the salt water, are wonderful. They are made of good things like olive oil (my Uncle Lamar swore by olive oil for cold weather skin care), coconut oil and beeswax, they are the right size/shape for a lot of travel soap containers, they don't spill or get messy in my gym bag and I'm not all over itchy anymore. Check out her blog (linked above) for a great eggroll recipe, and her shop (hopefully she'll add a couple lotion bars!) on Etsy. I also love her shampoo bars for the gym. soleRebels shoes- I don't actually own a pair YET. Hopefully soon. They were spotlighted on France24's Green is the New Black. Founder Bethlehem Tilahun Alemu runs an amazing company. 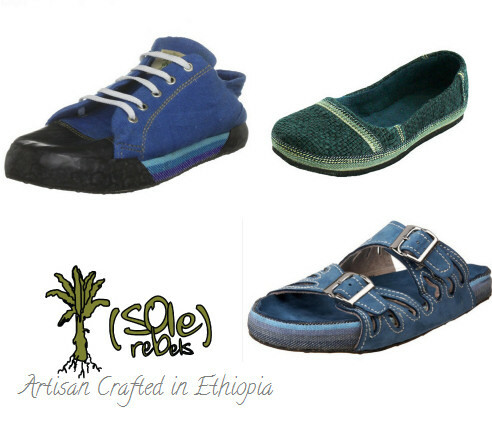 The shoes are made ethically using fair trade, artisan materials like hand-loomed organic cotton and small farm- free range leather, the soles are cut by hand from used truck tires. The company employs it's workers at 3 times the normal wage in that area AND pays for schooling for the children of employees. They are shipped in cinch sacks, also made of hand-loomed cotton so they aren't paying for shipping a lot of air in boxes. Since the sacks are re-usable, they don't contribute to waste with cardboard shoe boxes and really, the more I find out about this company, the more I like it. They are also willing to customize colors since the accents are loomed by hand. Marian Call's song Good Morning Moon. This cheerful track off her most recent album is one of the happiest songs I've ever heard, it's catchy, hopeful and just wonderful. It's refrain includes the phrase "Who's to say we're falling if we miss the ground?". I want to cross stitch that on something. North Pole Coffee - The Black Gold. Wow. Really, this is one of the best coffees I've ever had. Picked up a bag at the grocery store last week, and I'm savoring it and hoarding it like it was gold. It's low acid, and dark roasted to nearly black, the beans are oily and the coffee tastes *better* that most coffee smells. Not affiliated! These are all just things that are making me very happy right now. My husband quit his job a couple of weeks ago, and is currently looking for a new job. So we are budgeting carefully in the meantime. He's been getting more and more burnt out on the hospitality industry and with the added stress of what's been going on in our personal lives (losing my best friend and my uncle, plus before that, a lady he worked with had been killed on the job), he needed a change. So I'm thinking this could be the start of a wonderful new chapter in our lives and in his life professionally.